"It's a rip-off! ", I hear you cry. "A blatant marketing exercise for the new album!" MV's forthcoming February single, "Always Your Way", is their second re-release in a row, following November's "Pieces". Tut. They should be ashamed of themselves - making innocent young indie kids and rock fans fork out for a song they've already got. Well, hang on. Have we all HEARD "Always Your Way" mark two, yet? Premiered on the Evening Session recently, the previously elusive song was revealed in all its reworked glory. But is it any good? It's the same, familiar, heartspinning pop song that everyone who heard the original is familiar with... the delicious hooks, the bittersweet tang of the lyrics, the inherently sing-alongable melodic structure; there's one major difference. On its original release a year ago, it was a sparkling debut single from a hotly-tipped new band; it was the sound of promise. It hinted at a band who, if they could follow it up, we could love. This time around, the same factors don't apply - we all know that My Vitriol DID match up to our expectations. A year after "Always" was originally released, they've got a devoted army of fans, the attention of the music cognoscenti and an album ready for release. They've grown up, and so has the single. Gone is the rushed urgency of the song, the tinny but endearing quality of a debut single. This is the sound of a band who know exactly what they're doing, who know how they want to sound. 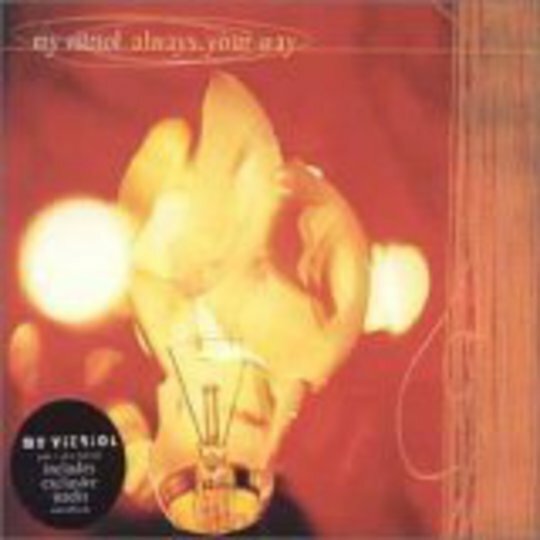 "Always Your Way" no longer sounds like a debut from an unknown band; it sounds like a My Vitriol song. It's bigger, more lustrous; it's the product of a band who are starting to realise their potential. Som's voice is a hell of a lot more developed - notably on the chorus. Where once he gave the impression of rushing headlong at the song and aiming randomly at the right notes - and to be fair, he USUALLY made it - there's now a sense that he's pacing himself, witholding the outburst of emotion until the crucial moments where it all comes pouring out in a torrent of passion. The same applies to the production; where once it was perhaps functional, it's now highly effective, flooding the track with - well, the best word is loveliness. A part of you can't help but miss the urgency and the edginess of the original, but My Vitriol reward your indulgence with a song that bleeds droplets of utter, blissful gorgeousness. And this time, everyone's invited.